I got a Doctor Who-themed present for my girlfriend last month, as she is also a Whovian, and to make it extra-special, I decided to whip up a custom box. I used sheets of balsa wood for the sides, bottom, and top, and used 1/8"x1/4" sticks of balsa to join the sheets at edges and corners. For good measure, I put a jumbo 7mm white/clear LED on the top as a light, but I didn't have the time to make that LED do anything. Using what I had at hand, the wood is "painted" with blue and black Sharpie markers. This weekend, however, I decided to pull out a breadboard, a 555 timer IC, and my residual recollections from my junior-year analog electronics course, and whipped up a fading circuit for my LED, powered by a 9V battery. Enjoy! Sweet. I should use my dads reserve of wood and balsa to build one too! You should! Once I figured out the geometry for the roof and the proper way to make it not fall apart while I tried to glue it, it wasn't too bad to make. Many thanks. 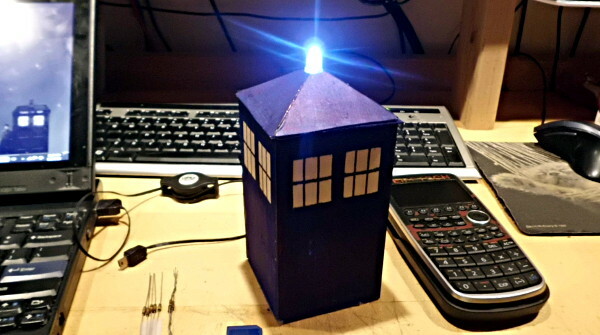 Bsparks also posted a video of a little plush TARDIS; I'm still waiting to find out if he made it himself for not. It otherwise looks completely and totally awesome. Back when I played with simple electronics I used a 555 IC all the time. Good show. Yes, it was intended to be a quick-and-dirty gift box but gradually grew beyond my plans. 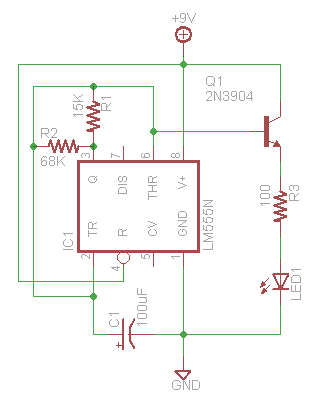 DShiznit, I do love a good 555 circuit, and hate when people use a microcontroller for something like this. Cheers! It's a simple enough circuit that you could easily build it, and I'm sure your woodworking skills far outshine my own.